Swami John Reis and The Blind Shake! Order vinyl or CD here! Death by kowabunga bunga! 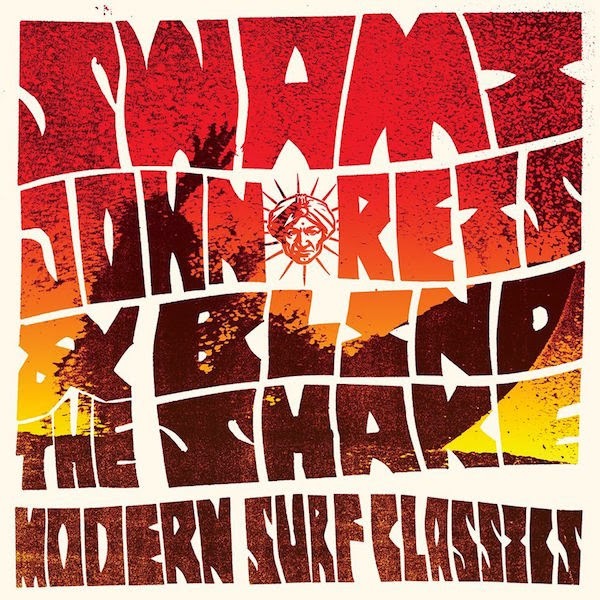 Swami John Reis and the Blind Shake pay tribute to the classic surf and rock n roll instrumentals of the 1960’s and update the genre for today’s more extreme, modern surfer. 13 original, modern surf compositions create this tidal wave of booming tom toms, skronking saxophones and a chaotic surge of guitars. Let this south swell topple you and may you be pinned in its undertow of reverb. Swami John Reis uses a similar aggro guitar approach as his playing in Hot Snakes and Night Marchers but allows the influences of Omar Khorshid, The Ventures, Link Wray, Randy Holden’s Fender IV and many other forgotten, instro combos rise to the surface for air. Joining Swami is Minneapolis’ The Blind Shake (Goner Records, Castle Face). The Blind Shake is a bombastic, power trio consisting of guitar, baritone guitar and drums and whose sound can be described as “muscular psych punk”. This collaboration generates a symphonic wall of twang and amplifies a cinematic sense of drama and tension with the addition of saxophone, doumbek, piano, riq, vibraphone and piano. To capture the essence of this vibe, some of the initial tracking of this material was recorded under Crystal Pier (San Diego) by Ben Moore who utilized a mobile recording VW van.